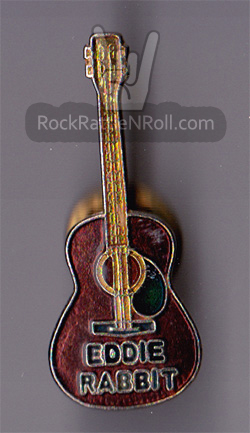 Description: Eddie Rabbit Guitar Shape Metal Concert Pin. Size 2". Description: 30" Elvis Presley Toy Plastic bank. Made by Signature Products. Size: 30"x12"x5". Note: Item is used in VG+ condition. Description: Eric Clapton Rock Radio Station Promo Sticker. Size 3x9.